PRETORIA, South Africa (CNN) -- African leaders Tuesday announced a deal that would allow Zimbabwe's long-stalled power-sharing agreement to move ahead, but the opposition said it had not signed off on the plan. 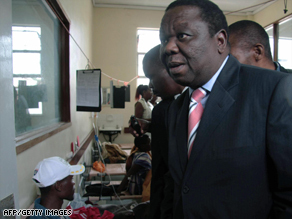 Morgan Tsvangirai tours a cholera ward at Budiriro Polyclinic in Harare last week. In a statement issued after talks that stretched into early Tuesday morning, the Southern African Development Community said Zimbabwe opposition leader Morgan Tsvangirai would be sworn in as Zimbabwe's prime minister on February 11. But Tsvangirai's Movement for Democratic Change swiftly responded that its concerns remained unresolved, and said it was disappointed in the process. "As far as the merits are concerned, our expectation was again that SADC would come up with a just resolution to the outstanding issues in the interest of Zimbabwe and all the parties concerned," the opposition said in a statement. "It was our expectation that the SADC processes would be aboveboard and beyond reproach." Under an agreement signed in September, following Zimbabwe's hotly disputed presidential election, Tsvangirai would share control of the government with President Robert Mugabe. But Tsvangirai has accused Mugabe of keeping the most powerful portfolios in the government for his ruling party. The 15-nation SADC has attempted to broker a resolution to the impasse for months. South African President Kgalema Motlanthe, the group's leader, announced that an agreement had been reached early Tuesday. A source close to the talks said Tsvangirai agreed to all the decisions that the SADC made, but that other MDC leaders were unhappy with the agreement once he left the talks. They also objected to Mugabe sitting with his fellow heads of state during their deliberations at the summit. The group said it would hold a meeting of its national council before deciding how to proceed. Amid the political dispute, Zimbabwe has been wracked by a collapsing economy and a spreading cholera epidemic. The European Union tightened sanctions on Zimbabwe's leadership on Monday, condemning President Robert Mugabe's government for its "ongoing failure to address the most basic economic and social needs of its people." The EU's General Affairs Council extended its current restrictions on Mugabe and his top aides, in place since 2004. It also added more than 60 other "persons and entities that are actively associated with the violence or human rights infringements of the regime." There was no immediate reaction from Mugabe's government to the declaration, but the 84-year-old leader has accused Western powers of trying to cripple his country's economy and drive him from power. Zimbabwe's economy is near total collapse, with an official inflation rate of 231 million percent, while the cholera outbreak has killed more than 2,700 people and sickened nearly 50,000, according to U.N. figures. The EU also urged Mugabe, who has led the south African country since independence in 1980, and Tsvangirai to comply with the power-sharing agreement.